“At Kate’s, we don’t skimp. 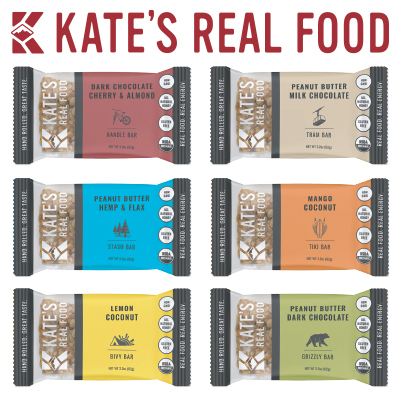 Our wholesome energy bars are small batch made with organic ingredients.” For outdoor play deep into the backcountry or for grab-and-go sustenance, you can count on Kate’s whole food bars to deliver. Long before Kate Schade became a business owner and whole foods advocate, she was a self-proclaimed ski bum. On her days off, she batched Tram Bars in her kitchen to fuel her adventurous on-the-go lifestyle. In line at 7:00 a.m., Kate would catch the first lift up at Jackson Hole Mountain Resort, ski all day, then grab a quick shower before slinging Italian food in the evenings. With no spare time to prepare meals, she depended on her wholesome Tram Bars to sustain her through the day. The Tram Bar recipe evolved over time (consistent with Kate’s cupboard availabilities) and with each tweak, the recipe perfected itself. Kate continued her routine; sometimes tossing bars to gawking, hung-over friends in the tramline. Still, she ignored her friends’ encouragement to start a viable Tram Bar business. “Too much work,” she confessed before dropping into a powder-filled couloir. After years of poking and prodding by her sometimes-hostile comrades, Kate bit the bullet and became an entrepreneur. While still working her night job and spending summers managing farm workers at Cosmic Apple Gardens, a local CSA farm, she also dedicated her spare time to producing and selling her now famous Tram Bars. Kate’s time on the farm helped her adopt the conscious eating habits that shaped today’s organic bar recipes.